All four works on this disc are in effect Trio Sonatas, with the two upper parts played on the viola da gamba and the harpsichord respectively and the bass on the harpsichord. Having had the pleasure of reviewing two earlier versions of J.S. Bach’s Sonatas played on the cello I was fascinated by the statement in the booklet that this is their first recording using a four-string Baroque cello. The audible differences are not enormous although the baroque cello as played here has a lighter and more flexible sound. 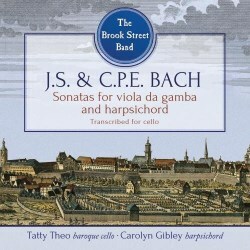 This is closer to the sound of the viola da gamba for which they were written even if the tone is deeper than the composer might have expected. Whilst I still prefer the gamba as it allows all three parts to be heard more clearly – the main problem here is that the harpsichord bass is occasionally obscured - it would be foolish to reject this disc on grounds of the instruments used. In any event the sheer beauty of sound of the harpsichord (by Alan Gotto after an instrument by Pierre Donzelague) more than makes up for any loss of clarity due to the use of a cello rather than a gamba. The performers are both members of The Brook Street Band, under whose auspices the disc appears. The main characteristic of their performances is their straightforward musicality. Sensible speeds are chosen, neither absurdly slow nor excessively fast as on many rival versions, and are maintained without affected hesitations. Phrasing is deft, clear and logical. Everything is in its place, and if there is some lack of the physical excitement in the fast movements that some performers bring to them the results overall are extremely satisfying. As the three J.S. Bach Sonatas last a mere 45 minutes or so there is space for a very enjoyable Sonata by C.P.E.Bach, different to his father in form and style but preserving the Trio Sonata texture. This disc does not offer the kind of extrovert performances of this music which can be found elsewhere, especially amongst those using cello and piano. Its fundamental honesty and musicality do nonetheless pay real dividends and result in performances that bring out the underlying character of these delightful works.